First impressions are vital in the real estate space; in fact, 50 percent of buyers found the home they purchased via the internet, according to the 2017 National Association of REALTORS® (NAR) Profile of Home Buyers and Sellers. Today, buyers are flooded by a sea of options when browsing for a home online; therefore, it's more important than ever that REALTORS® make their listings stand out. One option? Using drones, or unmanned aerial systems (UAS), for aerial photography and videography. "Drones can play an important role in telling a compelling story for a listing," says AJ Canaria, executive brand promoter at PlanOmatic, who emphasizes that the art of storytelling in real estate has evolved, making drones an increasingly popular tool for breathing in life to a property's narrative. "Whether it be photography or video, drones give a different perspective that allows the consumer to visualize scale and proximity of neighboring areas and imagine a lifestyle," Canaria says. One noted perk? Listings typically sell faster when they are marketed in a robust and innovative way. Canaria has witnessed firsthand the power of drone photography and videography in relation to market time. "I had one particular agent ask for my expertise to showcase the river next to the house with aerial photography," says Canaria, noting that the listing had been on the market for about a year at that time and was on its third listing agent. "She sold the property in two weeks because the aerial photos told a different story, showcasing the proximity of the river to the house and highlighting the surrounding nature." In what markets is this technology being used? The luxury segment primarily utilizes drones to accentuate the amount of land a property has or the various amenities available on the grounds, such as tennis courts or pools, as well as privacy for many of these homes in the form of gated communities or lush greenery that works to section off property lines. However, the usage is swiftly changing, expanding into other markets in which REALTORS® need an advantage against competitors, regardless of price range, to get their homes sold as quickly as possible. "High-end luxury properties and land are most common, but I've been seeing more aerial work done on mid-tier homes to showcase scale of the property and, more importantly, proximity to key areas surrounding the property," says Canaria. "I can't tell you how important this is, especially with existing properties that have been on the market for a while or properties that can potentially be teardowns." As with all new technology, however, there are concerns, specifically revolving around having to navigate legal obstacles. Some drones are restricted in the air space they can be flown in. "Restrictions for real estate are generally around no-fly zone areas like airports," says Canaria. "It's important to understand where the radius is for heliports, too, to ensure safe flying." Drone technology itself, as well, is now being built with restrictions (both legal- and weather-related) in mind. "Nowadays, consumer drones are very intelligent," Canaria says. "There are various apps, such as UAV Forecast, that read your GPS coordinates, weather, wind and visibility, and let you know if it's safe to fly." Another top concern? Privacy. Consumers have reported various instances of feeling uncomfortable when seeing a drone flying around their property. 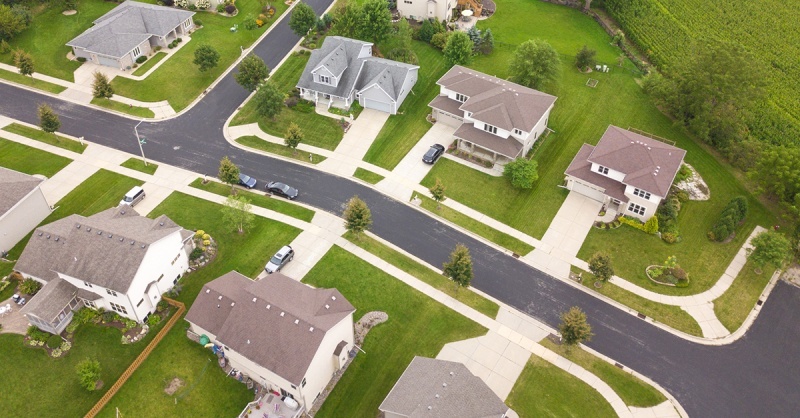 A way to relieve consumer fears: Remind property owners that drones used to photograph or film a listing are typically utilizing a wide-angle lens at a height that makes small details irrelevant. "Privacy is what people worry about the most with drones, fearing they will be spying on their day-to-day," says Canaria. "What the general public doesn't know is that a majority of all consumer drones have wide-angle lenses. The wide angle makes it very difficult to make out exactly who people are in the photo/video if the drone isn't close, so privacy shouldn't be a big cause of concern. They are making drones now that have zoom lenses, but even those lenses don't have enough of a zoom to be a concern." Once these tech- and privacy-related apprehensions are tackled, drone usage in real estate can make the difference between a stale listing with average photographs or a hot property that flies off the market in a matter of days. "The true value is in the storytelling of the property, but it's also in what the agent brings to their brand," Canaria emphasizes. "The agents that know how to bring the most out of the property by utilizing drone services to elevate the listing have a powerful tool to help them sell faster. "It's all in the story you want to tell the prospective buyer, and how you're utilizing photos and video to bring that story to life." Liz Dominguez is RISMedia's associate content editor. Email her your real estate news ideas at ldominguez@rismedia.com.